on the entity and all its children. entity alone or on the entity and all its children. .SYNOPSIS Returns the state of Alarm actions. the entity alone or for the entity and all its children. Line 23: We declare the Entity parameter as a base Inventory object. That way you can pass all types of vSphere entities to the function. Line 33-39,71-77: In the $objects variable the function collects all the entities involved. In case Recurse is True, all the child entities are obtained through the Get-Inventory cmdlet. Line 41: The function calls the EnableAlarmActions method to change the alarm actions state of each entity. The value of the Enabled switch determines if the alarm actions will be enabled or disabled. Line 70: This line makes sure we have the latest situation for the entity. Remember that the objects PowerCLI produces are not updated automatically when something changes in the entity. Line 81: To make the Type property a bit more readable, the Impl and Wrapper suffixes are removed. The result is displayed on the console as follows. The function can also be used in a pipeline construct. The following lines will do exactly the same as the previous example. To change the state of the alarm actions, we can use the Set-AlarmActionState function. The following example will disable the alarm actions on Cluster1 and all its children. To confirm the change, the samepl calls the Get-AlarmActionState function to display the state. In the console output we can see that the state of the alarm actions has effectively been changed. And this for the cluster and all its child entities. 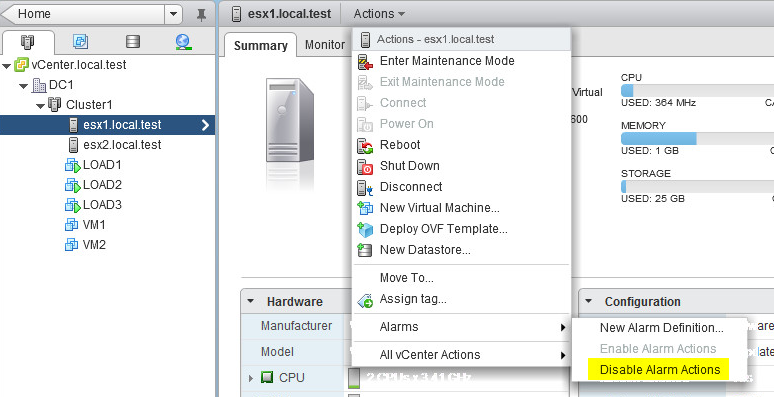 Another vSphere feature we can now use in our automation scripts. I forgot to ask, do there is a way to track who disable the alarm of a device (owner) ? Do you know why this filter doesn’t work ? You can do auditing of changes to an alarm definition by tracking the AlarmReconfiguredEvent entries in the events DB. Let me know if you need some help with such a script ? I need to be notified whenever an VCenter alarm is enabled or disabled along with person’s name who performed the action. Can you suggest if any script for this? I would look at the AlarmReconfiguredEvent events, if someone changes enabled/disabled, it should be in these events. I do have the requirement to find who and when the alarm was disabled on an entity like cluster. Can you help me with it please. having issue, some one cleared the vcenter hardware alarm , how to collect host having hardware issue, is there any powercli script ? Get-AlarmActionState : Die Argumenttransformation für den Parameter "Entity" kann nicht verarbeitet werden. Der Wert "HAL-PROD_CL1" vom Typ "System.String" kann nicht in den Typ "VMware.VimAutomation.ViCore.Impl.V1.Inventory.InventoryItemImpl" konvertiert werden. Do you know the problem and how I could solve it? THis would be fine. Don’t know what I’m doing wrong. If I save this as a ps1 file and run it from powercli, I get nothing. @Vman, when you download functions you have to save them in a .ps1 file. That .ps1 on itself will not do anything. To make the 2 functions usable from the PS prompt or in your own scripts, you will have to dot-source the .ps1 file containing the functions. There is a blank between the 2 dots, and it assumes the .ps1 file is saved in the folder C:\Scripts. Once this is done, you can call any of the 2 functions as shown in the Sample Usage section. @LucD,i have save the Script to the “C:\Sctriptis\” named functions.ps1. Unexpected token ‘State’ in expression or statement. I'll see if I can work it out, but just thought I'd give you a heads up. That “State” shouldn’t be there. I updated the post.